Commonly pluralized to refer to those territories that the Pope was the civil and spiritual ruler of, the seeds of the Papal States as a sovereign political entity were planted in the 6th Century. The Eastern Roman (or Byzantine) government in Constantinople undertook a reconquest of Italy that took decades, devastated the countries political and economic structure and eventually limited the power of the Byzantine authority. A consequence of this was that the Bishop of Rome (as the Pope was commonly still referred to), largely by default, began to take on much of the ruling authority and projected this around the area of Rome. In practise, a Duchy of Rome began to emerge, an independent state ruled by the Church. The precise nature of the relationship between the Popes and Emperors was not at first abundantly clear. Was the Pope a sovereign ruler of a separate realm in central Italy, or were the Papal States merely a part of the Frankish Empire over which he Popes had administrative control?. Whatever the truth, after several 10th century campaigns, the German emperors rarely interfered in Italian affairs, and by 1300 the Papal States were effectively independent. From this point onwards and especially during the Renaissance, the territory expanded greatly. Though in practise the Pope only nominally controlled the states and minor princes ruled much of the territory, by the 18th century they had grown to their peak, encompassing most of Central Italy. The French Revolution however proved as disastrous for the temporal territories of the Papacy as it was for the Catholic Church in general. French forces invaded and declared the area a Roman Republic, and although the Papal States were restored in June 1800, this marked the beginning of the end. 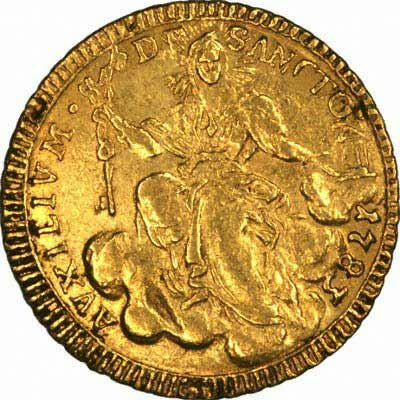 Further invasions by the French coupled with the knock on effect that the Napoleonic era stirred up within the Italian nationals meant that the Papal States became seen increasingly as an obstacle to Italian unity. The Law of Guarantees in 1871 was the final nail in the coffin, and Pope Pius IX was the final pope to have sovereignty over the Papal sphere of influence. 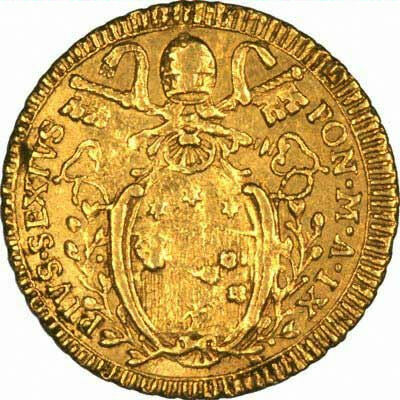 The coin denomination used by Papal States include zecchino, (plural zecchini), scudo (plural scudi), and lira (plural lire). We have given Papal States Zecchini their own page. PIUS IX PONT MAX A XXI With the engravers initials below the bust. Roman Numerals = Regnal date. Please see our Vatican City page.